Main Street in Vancouver, BC is one of the city's most popular destinations. Running north-south from the east side of Downtown Vancouver to the city's southern boundary, and serving as the loose divider between the westside of Vancouver and East Vancouver, Main Street has attractions, nightlife, and diverse dining, including top spots for sushi and vegetarian cuisine. In this Visitor Guide to Main Street, I'll walk you through all Main Street has to offer, from Chinatown to trendy "South Main" (Mount Pleasant) to the Punjabi Market (Little India). Starting at its north "end," Main Street "begins" just east of Downtown Vancouver, where it runs through the heart of Vancouver's historic Chinatown. Vancouver's Chinatown is the third-largest Chinatown in North America (behind New York and San Francisco). It's one of Vancouver's Top 10 Attractions for its historic landmarks--including the world's narrowest building, and the beautiful Dr. Sun Yat Sen Chinese Garden--shopping and dining. If you are staying in Downtown Vancouver, you can easily reach Chinatown and Main Street via the Canada Line / SkyTrain, Vancouver's rapid transit system; take the train to the Stadium - Chinatown Station. Science World is both one of Vancouver's best attractions for young kids (kids 10 and under) and a perfect rainy day activity. (Since the locals all know this, expect bigger crowds on a rainy day.) Geared for kids, this extremely interactive science museum has an activity space / mini gallery for babies and toddlers, the very fun, physics-oriented Eureka! Gallery (where kids launch balls and parachutes and experiment with sound and light), and special exhibits. Vancouver is fast becoming a must-visit destination for craft beer lovers. There are dozens of craft breweries with tasting rooms in the city (and even more throughout the Greater Vancouver area), three of which are on (or very near) Main Street. Brassneck Brewery (2148 Main Street) offers great sample paddles and has knowledgeable staff. 33 Acres (15 West 8th Avenue) is sleek and modern. Main Street Brewery (261 East 7th Avenue) has a great Vancouver vibe and is family-friendly. All three Main Street breweries are south of Science World; if you're walking, it takes about 20 - 30 minutes to walk from Science World to Brassneck Brewery. You can also hop on a bus heading south on Main Street. While the official neighborhood name is Mount Pleasant, the portion of Main Street that runs from 2nd Avenue to 33 Avenue is also known as "South Main" or "SoMa". While all of Vancouver has gentrified over the last twenty years, this area has rapidly and radically changed. Once genuinely seedy, students and artists moved in about 20 years ago, followed by hipsters--who transformed South Main into the trendy neighborhood it is today--and now affluent hipsters. There's a very Vancouver-vibe to South Main that makes it a great destination for visitors. Along with several of Main Street's best restaurants and nightlife (see below), this area is one of the Top 10 Places to Shop in Vancouver. Along with home decor shops and antiques, there's boutique Canadian fashion such as​ Eugene Choo for men and women, and curio shops, like the locally-famous ​Front & Company. If you don't have a car, you will have to take a bus to South Main. If you get off the bus at Broadway and Main Street, you can simply walk south and explore the street--and all its shops--on foot. Campagnolo (1020 Main Street) is a popular, moderately-expensive Italian restaurant very close to Science World. Lucky's Doughnuts (2902 Main Street) is another local favorite, famed for its home-made doughnuts. The General Public (3289 Main Street) and Toshi Sushi (181 E 16th Avenue) are two of the Top 5 Sushi Restaurants in Vancouver, both moderately priced. Sun Sui Wah (3888 Main Street) is a gigantic Chinese restaurant famed for its fresh seafood and dim sum. All Indian Sweets (6507 Main Street) is the place to go for an Indian buffet in the Punjabi Market / Little India. Main Street is known locally for its hipster nightlife: craft breweries (see above) and brew pubs, relaxed bars, live music. It doesn't have the reputation for hard-partying that you find in Downtown Vancouver's Granville Street Entertainment District; it's also less expensive (and less "dressed up") than Yaletown nightlife or Gastown nightlife. The Whip (209 E. 6th Avenue) is a gallery / bar with craft brews and seasonal casks. Narrow Lounge (1898 Main Street) has a hipster, speakeasy vibe and is marked only by a red light at its alley entrance. The Cascade Room (2616 Main Street) is both a restaurant (Pacific Northwest cuisine) and a hip nightspot. The Five Point (3124 Main Street) is casual pub beloved by locals. The Main on Main (4210 Main Street) has live music and local craft beers. 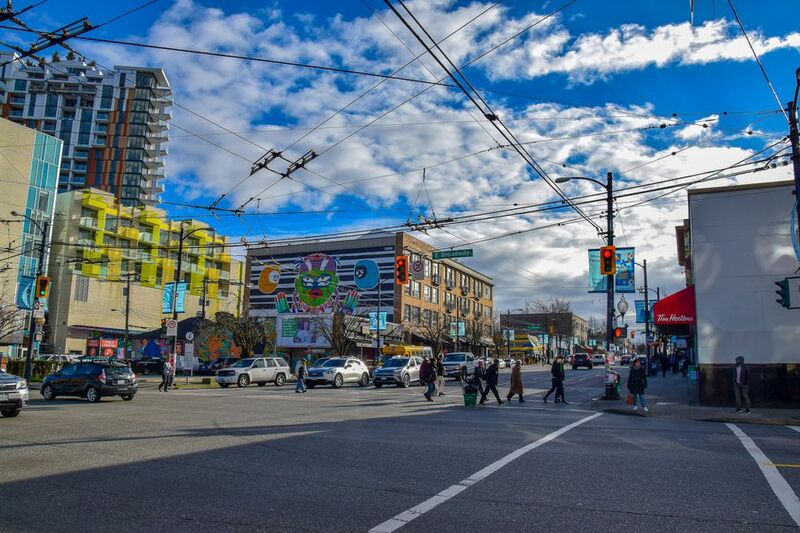 While Vancouver has a large South Asian population, its Punjabi Market / Little India district has shrunk in the last 15 years. Today, there are only a dozen or so shops covering just a few blocks of Main Street (48th Avenue to 51st Avenue), though the area does still play host to the annual Vancouver Vaisahki Day Parade. Though it is small--so, not a big selection of shops--it is still a great place to find Indian groceries and products, and Indian jewelry, from inexpensive bangles to fine gold. There's also a little bit of Indian fashion, including sarees and lehengas. There is no rapid transit to the Punjabi Market. If you have a car, driving is easiest (there's plenty of street parking), or you can take the bus.